Key rings come in many styles at MyBinding. All are perfect for security and identification purposes. The key rings and findings include steel ball chains with connectors, heat treated split rings, two-ring detachable, jewelry findings, adjustable neck cords, split rings with round edges and edges hammered, and the most popular Magnapower magnetic badge findings for all documentation and identification needs. Visibility and accessibility become a snap with these affordable products. Check them out today. Mounting Plate Dimensions: 1-3/4" x 1/2"
Mounting Plate Dimensions: 1-1/4" x 3/8"
This is MyBinding video. We are proud to bring you a wide variety of key rings and findings perfect for all identification and security needs. 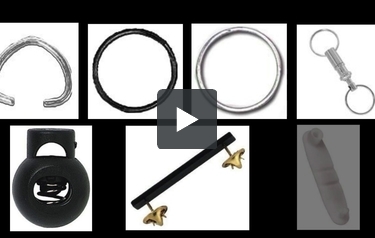 We have a variety of products, including steel ball chains with connectors, split rings with round edges and hammered edges, heat-treated split rings, detachable two-ring key rings, jewelry findings, adjustable neck cord locks and Magna Power magnetic badge findings. Give us a call or a click. We pride ourselves in our customer service and our custom orders. When image matters, MyBinding.